At this point, I am starting to feel a bit like a broken record - always talking (and or complaining) about what I am going to put on the dinner table. Now, let me be clear - I am a terrible list maker when it comes to grocery shopping - which is probably what aides in my general dinner time malaise about what to cook. Some people go in with a plan and a menu - I, on the other hand, usually just wing it - seeing what inspires me while I am there and coming up with a game plan on the spot. While it presents its challenges, it can be a rather rewarding and fun way to tackle the week - plus, in my case, it helps me discover new products, products that I would otherwise not have used in my cooking. There are very certain attributes that we all crave when we think about food - for me, it is always flavor first and then crunch - I like food that has a certain crunch to it (i.e, onion rings, french fries, etc!). Adding both of these, in a big way, to an easy weeknight dinner is a huge plus for me - as is, trying to keep it healthy. 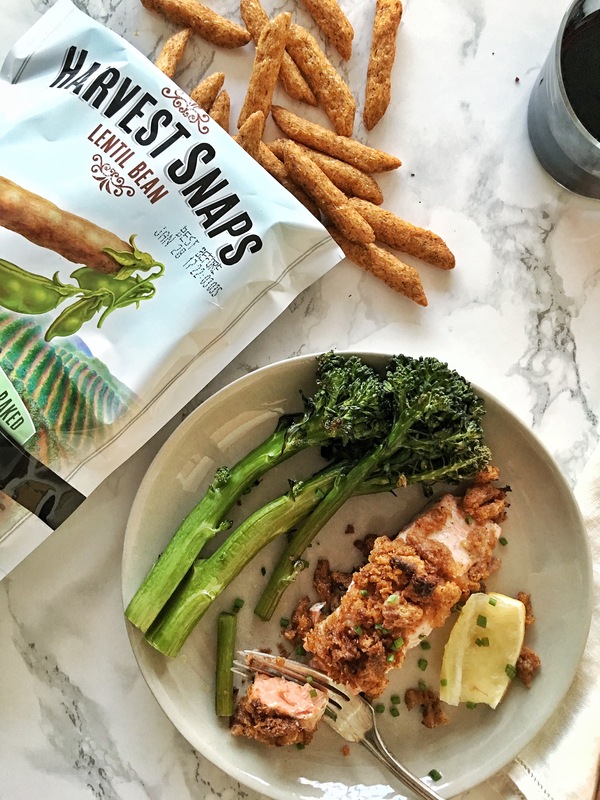 Enter Harvest Snaps - these little Pea Crisps are a highly addictive, gluten-free snack - like the type where a bag easily disappears in less than 5 minutes. They come in a variety of flavors and they pack all the crunch and punch of chips, but don’t cause the feelings of guilt. I wanted to see how I could use these to punch up a weeknight dinner. We’re huge fans of salmon in our household, and in particular, Coho Salmon, wild caught. Salmon is a great way to get a mega dose of Omega-3 and it is a lean protein that provides all the right comforting flavors for an easy weeknight meal. Using the Harvest Snaps Onion & Thyme Lentil Crisps as a crunchy topping - this one pan dinner is on the table quickly and leaves little mess to be cleaned up afterwards. This recipe is designed to feed two, but can easily be scaled up or down to suit your needs. Place Harvest Snaps in a resealable bag and crush using a rolling pin or heavy bottom pot and put in small mixing bowl. Heat butter in microwave for 30 seconds, or just until melted and mix into crushed Harvest Snaps & set aside. In a small mixing bowl, combine creme fraiche, granulated onion, mustard powder and salt. Set aside. 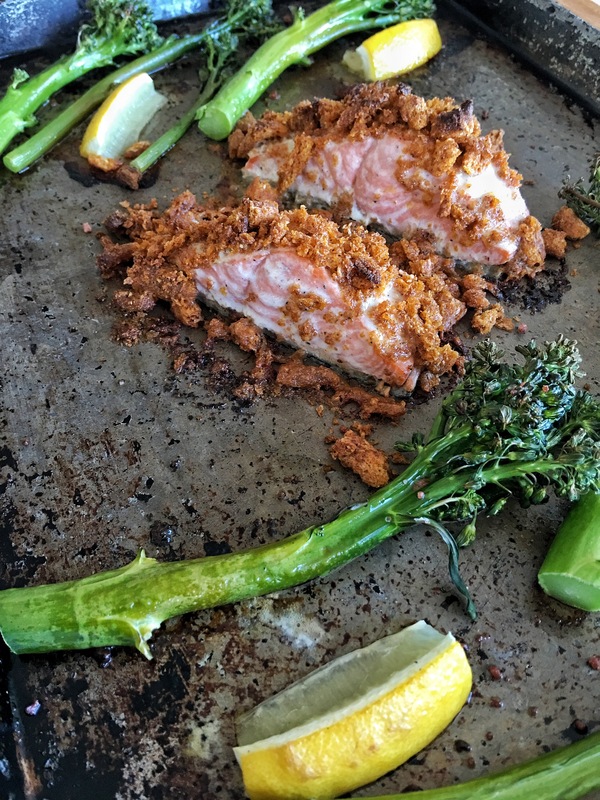 On a large rimmed sheet pan, place salmon, skin side down. 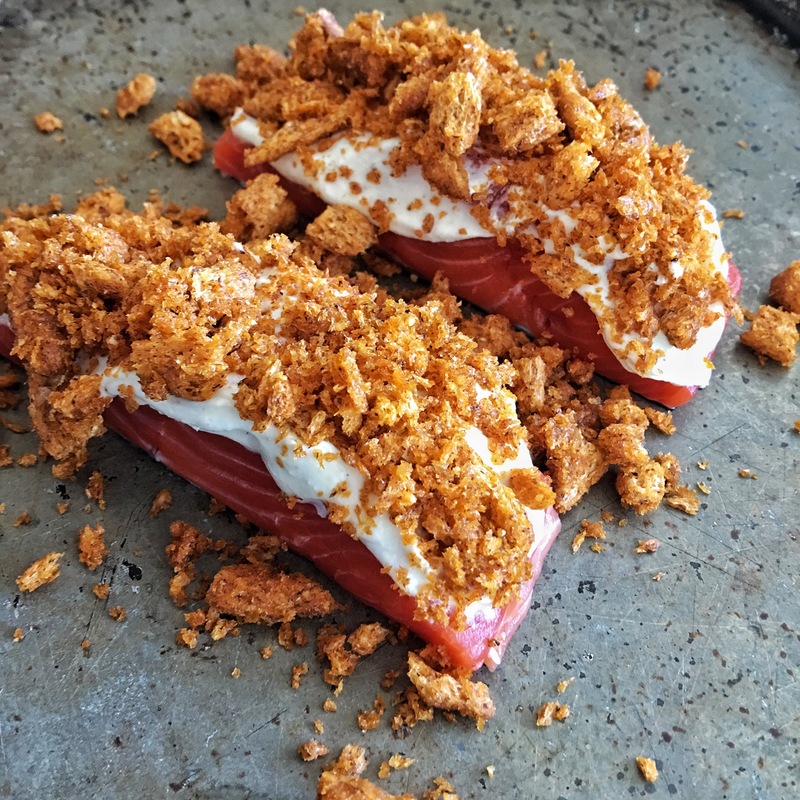 Spread a generous layer of seasoned creme fraiche over the salmon and top with the Harvest Snap topping. Place broccolini and lemon wedges around the salmon in an even layer - drizzle with olive oil and sprinkle with salt and pepper. Roast in oven for 12 minutes, or until salmon is light pink.